A very sociable boat with some handy features to make her easy to handle with a small crew make for a very attractive 62-footer. 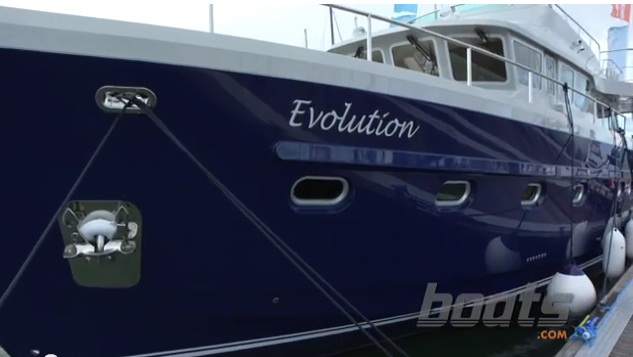 This is the latest offering from British powerboat builder Princess - the 62. One of the first things that strikes you about this model is the huge amount of glass in the side, giving you amazing views over the sea, as you can see in the First Look Video below. 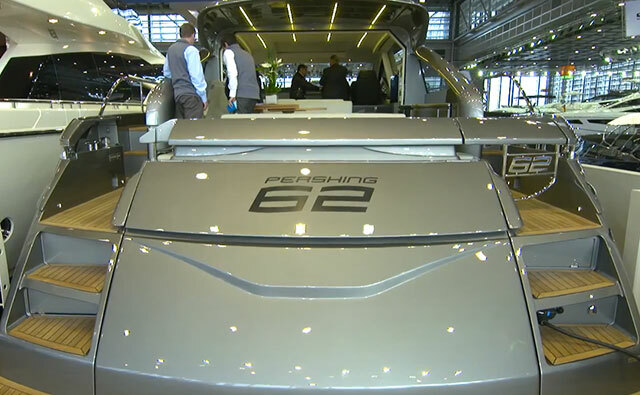 One of the biggest trends with modern powerboats is sociability and the Princess 62 really has that wrapped up. Here is a beautiful circular dining area, with easy access to the helmsman for a chat as you're going along, and further back another larger table with a U settee around it and bar and fridge opposite. 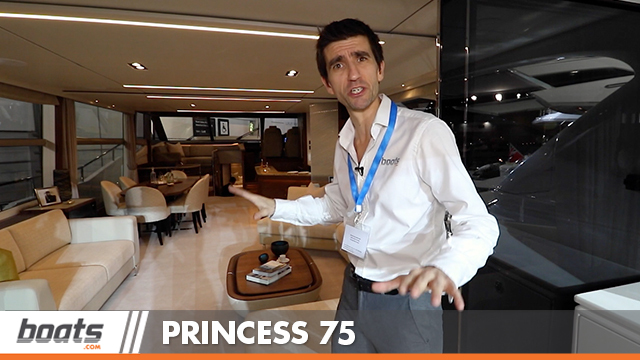 Now the Princess 62 is a large volume boat, but she is still easy to drive with nice touches like the strategically-placed extra helm station so you can look down the side deck and dock starboard side too. In the saloon there is a lot of space, a small galley off to the port side, helm station at the far end, big windows lots of light and lots of headroom. The engine room, which has stooped headroom, is just under the saloon and power comes from two D13 Volvo Penta 900HP diesels on shaft drives and Princess says she will reach top speeds a shade over 30 knots. 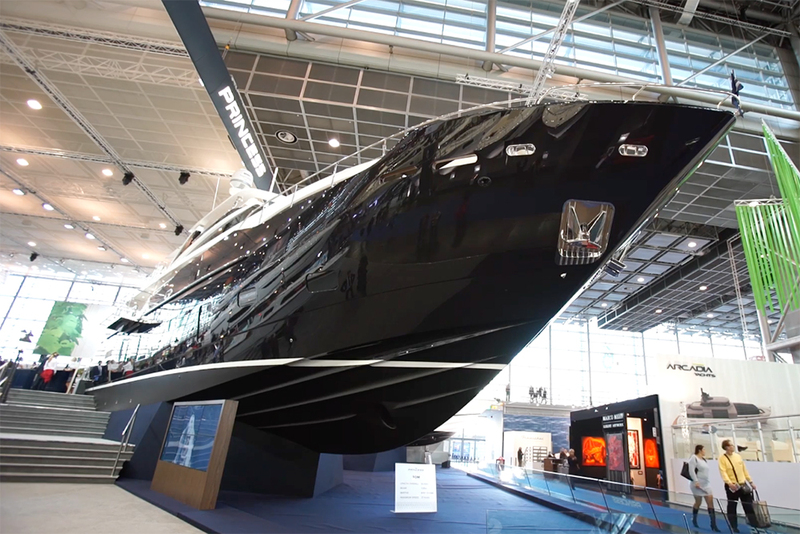 This boat can sleep six, there's an island double forward in the VIP suite with nice views either side of the bow. There is double, or twin in the guest cabin - hydraulically the berths can be moved together aft there is the full-width owner's cabin. 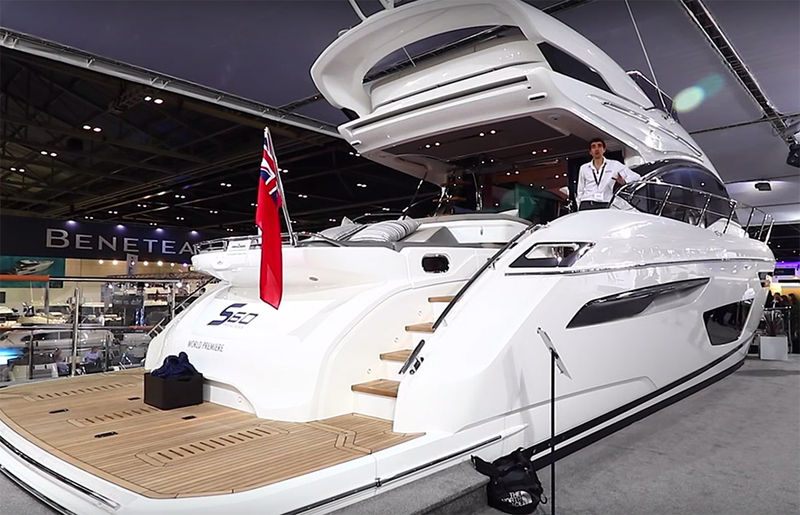 The finish is to Princess's very high standards, the lower helm position has a lovely touch screen controls and engine repeaters. The boat you can see in our video includes the 'Allure' package so you've got nicely stitched seats, subtle lighting and other touches, which puts the price at £2 million including VAT. Search all the Princess yachts for sale on boats.com.